Why wear your heart on your sleeve when you can wear it on your tooth! The beautiful Smilegems Heart design is available in both 24ct yellow and 18ct white dental gold. You'll be the star of the show with this beautiful Smilegems design which is available in both 24ct yellow and 18ct white dental gold. If you love the glow of the crescent moon, then this beautiful Smilegems design is for you. It is available in both 24ct yellow and 18ct white dental gold. The simple, yet beautiful Smilegems Teardrop design is available in both 24ct yellow and 18ct white dental gold. Simple and to the point... This perfect little gem is available in 24ct yellow and 18ct white gold. The simple and elegant Smilegems Diamond shape design is available in both 24ct yellow and 18ct white dental gold. Our finely detailed Hamsa Hand is a replica of the ancient eastern amulet said to be the hand of God and bring its wearer Happiness, Luck, Health and Good fortune this talismanic symbol is also believed to give protection against evil. The beautiful Smilegems Paisley design is available in both 24ct yellow and 18ct white dental gold. Please note that the Paisley is also available with either a real diamond, ruby, emerald or sapphire set into the design. See page 3 for details. 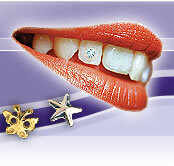 Money really does talk with the popular Smilegems Dollar 3D design. This is available in both 22ct yellow and 18ct white dental gold. The trendy Smilegems Cowboy Boot 3D design is available in both 22ct yellow and 18ct white dental gold. For all you Boot Scootin' Boogiers!!! The unique Smilegems Biker Shield 3D design is available in both 22ct yellow and 18ct white dental gold. This piece has a real cult following!!! Especially for those who want to attract good luck, the popular Smilegems Horseshoe 3D design is available in both 22ct yellow and 18ct white dental gold. For all you horse lovers, the gorgeous Smilegems Horse Head 3D design is available in both 22ct yellow and 18ct white dental gold. The popular and fun, Smilegems Mickey 3D design is available in both 22ct yellow and 18ct white dental gold. Attract some honey with the adorable, Smilegems Pooh Bear 3D design which is available in both 22ct yellow and 18ct white dental gold. 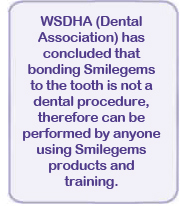 The ever bouncy Smilegems Tigger 3D design is available in both 22ct yellow and 18ct white dental gold. The gorgeous best friend of Pooh Bear is our Smilegems Piglet 3D design. This is available in both 22ct yellow and 18ct white dental gold. Our popular statement piece, the Smilegems 'Male' 3D design is available in both 22ct yellow and 18ct white dental gold. Our popular statement piece, the Smilegems 'Female' 3D design is available in both 22ct yellow and 18ct white dental gold. The Smilegems Cowboy Hat 3D design is available in both 22ct yellow and 18ct white dental gold - for a real "yeehaw!! !